“I’ve pretended a lot of things the past sixteen years, but I can’t pretend to feel that” (11). With those words, a woman who has just almost lost her husband to sudden illness, knows she has to leave him. 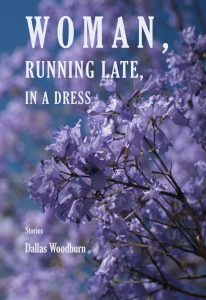 So begins award-winning Dallas Woodburn’s short story collection Woman, Running Late in a Dress, nominated for multiple awards including the Flannery O’Connor Award for Short Fiction. Woodburn’s thirteen interconnected stories chart seismic emotional upheaval that grinds ominously from below and explodes onto the surface of people who might live down your street, or in your apartment building, or be you yourself. With a breathless pace, readers looking to be known on the page in their own trauma will see a reflection haunting and yet empathetic. Woodburn creates a space where readers are unable to look away, not with the eyes of highway rubberneckers who pass by with a sigh of relief that they are not in the flashing lights, but with a grasping hope that somehow, these characters trying to survive the unimaginable will find peace. With an unsparing eye, Woodburn pulls the reader into experiences that slice and flay the human soul. Woodburn dares to write multiple stories of the grief of children lost, missing, and dying. She mines the hidden recesses of loss and ruin carried within people, people who wear no obvious markings that their worlds are torn apart. She trusts the reader to hold and honor their stories. Characters appear and reappear in other’s lives. But the characters seem to reflect the modern world, each carrying a burden so great as to not be manageable, but the hurt forming a force field that repels them from others’ suffering as well, opposite poles of the same material, doomed never to meet and become stronger by linking together. While Woodburn does not cheat the reader by providing pat, happy endings, for such endings would both cut the edge of the stories, and irritate the characters who even in their longing for happiness, know they are forever different for their struggles. Rather she drapes them in jacaranda blossoms and riddles, and perhaps a bit of luck, and sends them on their way, forever in the reader’s minds, to carry on their lives in a hundred different iterations of possibility. “And yet. Here I am, walking…towards the light…I try to hold the breakable things steady in my hands” (184). Once the stories end, the reader will want to begin again, with the knowledge the stories are connected, to understand the characters better, a new set of stories read with more knowing eyes. 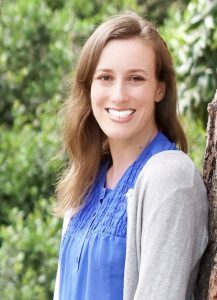 Christine Thomas Alderman is a writer for adults and children and an educator who holds degrees from Vanderbilt and Harvard Universities. Her work has been published by the Bath Flash Fiction Anthology, To Carry Her Home, duendeliterary.org, and the Ploughshares blog (pshares.org), among others. Find her at christinethomasalderman.com.